1: www.gashe.ac.uk [accessed on 11 April 2011]. 2: www.gashe.ac.uk [accessed on 11 April 2011]. 3: www.gashe.ac.uk [accessed on 11 April 2011]. 4: www.gashe.ac.uk [accessed on 11 April 2011]. 5: Michael Moss, Moira Rankin and Lesley Richmond (compilers), Who, Where and When: The History and Constitution of the University of Glasgow, Glasgow: University of Glasgow, 2001, pp. 12–13. 6: University of Glasgow Archive Services: Anderson's College Medical School minutes, GB0248 DC244/1/4, 31 August 1887. 7: University of Glasgow Archive Services: Anderson's College Medical School minutes, GB0248 DC244/1/4, 9 October 1888. 8: University of Glasgow Archive Services: Anderson's College Medical School minutes, GB0248 DC244/1/4, 9 October 1888; 26 October 1888; 12 November 1888. 9: University of Glasgow Archive Services: Anderson's College Medical School minutes, GB0248 DC244/1/4, 23 January 1889. 10: University of Glasgow Archive Services: Anderson's College Medical School minutes, GB0248 DC244/1/4, 5 April 1889. 11: Glasgow Herald, 1 June 1889, p. 4. 12: University of Glasgow Archive Services: Anderson's College Medical School minutes, GB0248 DC244/1/4, 31 July 1889. 13: Glasgow Herald, 23 October 1889, p. 9. 14: University of Glasgow Archive Services: Anderson's College Medical School minutes, GB0248 DC244/1/4, 15 October 1890. 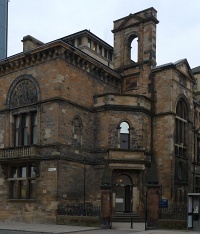 15: The Hunterian, University of Glasgow: John Honeyman & Keppie/Honeyman, Keppie & Mackintosh job book, GLAHA 53061, p. 17. 16: University of Glasgow Archive Services: Anderson's College Medical School, letter from secretary and treasurer, George Middleton, to Professor Arthur J. Ballantyne, regarding the change of name, 24 October 1913, GB0248 DC244/14/36. 17: 'Anderson's College Medical School', Dictionary of Scottish Architects, 1840–1980, www.scottisharchitects.org.uk [accessed 11 April 2011]. 18: Michael Moss, Moira Rankin and Lesley Richmond (compilers), Who, Where and When: The History and Constitution of the University of Glasgow, Glasgow: University of Glasgow, 2001, p. 13. 19: 'Anderson's College Medical School', Dictionary of Scottish Architects, 1840–1980, www.scottisharchitects.org.uk [accessed 11 April 2011]. 20: www.universitystory.gla.ac.uk [accessed 11 April 2011]. 21: www.universitystory.gla.ac.uk [accessed 11 April 2011].